Yesterday I was torn between streaming Monaco or Mark of the Ninja. In the end, technical reasons forced me to roll with Mark of the Ninja and I thought “hey, you know what? This is great. I saw this game in person at PAX 2012 in the Indie 10, and I thought it looked rad, and now I am finally allowing myself to play it. This is gonna be great; let’s do this!” Can you read all the fake pep? Can you decipher my lies better than I can myself? Here’s the thing – I know I hate stealth. I have always hated stealth. And I knew Mark of the Ninja has gotten oodles of praise for it’s comprehensive and impressive implementation of a great stealth system. So how was this really going to go, huh? COME ON, LAURIE. BE HONEST WITH YOURSELF. Sure enough, I lacked all patience. I would spawn and run blindly at obstacles and difficult enemies over and over and over until I would throw my hands up and say “I must be doing it wrong! I must need to Google it!” then I would try to speed-Google a solution, on-stream, on my phone, realize I can’t because there are no level names visible when I pause the game and I have no idea where I am, then go back and due to the very brief rest I gave my mind and muscle memory, I would be able to get through to the next checkpoint without dying. Sure the assassinations were so deeply, profoundly satisfying (top notch animations and sound effects, fo’ sho’) but all the in between of trying to sneak up to someone to kill them, etc – no thanks. I knew this when I played The Last of Us only until Joel and Ellie got to the town with the crazy guy and I had to stealth through the graveyard and the houses to the bus yard at the school and I died so many times I stopped playing until I got the game again, remastered, with my new PS4 at the end of last year. I don’t have the patience for stealth, which is indicative of the very little patience I have for most things in my life. And yet. Here I was. Again. And the “why” finally dawned on me after I slogged through a (to be honest) mediocre stream of the entirety of Mark of the Ninja. I am deeply impressed by stealth game mechanics and systems. There is honestly so much technical precision that goes in to very well made stealth games, it’s remarkable. The genre itself hones so closely down on level design and character/NPC interactions, I think I subconciously want to observe it all but subsequently hate it all the way through. Even when I was at the peak of frustration with Mark of the Ninja I said out loud “But I mean . . . I still want to finish it.” And despite my lack of skill or interest in games like Bloodborne or Dark Souls, I believe the entire genre of stealth is at it’s best when it’s most punishing. Unlike the pandering flip-flopping of Assassin’s Creed, Mark of the Ninja does not allow multiple play types. Sure there are multiple paths and different strategies to implement your stealth throughout rooms during a level but at the end of every experience, you had to be the ninja. You never really have to be an assassin with Ubisoft. I’m ecstatic to never play Mark of the Ninja ever again. I’m also ecstatic to recommend it to every stealth game lover I know. I’m also ecstatic that I got to experience a quintessential stealth experience in a polished, satisfying, beautiful indie game. Now please, critically acclaimed stealth games – never sneak your way into my life again. When I was planning what to play on my 3rd day of full-time Twitch streaming, I was at a loss. I had decided to start two days earlier with Middle-earth: Shadows of Mordor but after lackluster intro content (including tutorials) and visuals that disappoint for just having come out in 2015, I wasn’t engaged and excited to play the game, and therefore put out fairly poor stream. The next day, I decided to finally give The Banner Saga a shot and while the visuals and music and emotion of the game were portrayed excellently, it just didn’t seem like the type of game that would give a good stream experience and I wasn’t particularly excited to continue playing it. Did I mention that I am also just abhorrently bad at tactics games and brought my usual talent to The Banner Saga? Yeah. So there I was, needing something to really pep up the “Past Broadcasts” on my channel. And then I stumbled over Dust: An Elysian Tail in my Steam library. It was in my wheelhouse – platformer, button masher, indie, great art, jammin’ tunes. This was my time to shine. And bless Dust‘s heart, it totally worked! I had a blast playing the game during the past 3 streams and finishing it up last night. I might stream it a 4th time to wrap up the 117%. Which is actually a perfect segue to the nostalgia-laced trip it was in this final stream. SPOILERS ABOUT THE SECRET FRIEND COLLECTIBLES AHEAD (no main story line spoilers) (oh and 117% was the full completion percentage of Spyro so . . . nostalgia). A kind Twitch passerby stopped to watch the stream and while we were chatting back and forth about the game, which he loves to death, we were talking about all of the extra “secret friends” you can get by unlocking special chests throughout the different regions. I had already collected Super Meat Boy, Howard the Duck*, and the main male character of Spelunky. He was super in to helping me find the rest of the secret friends before I called it quits on the game (I’m not generally in to collecting achievements or completion percentages for Steam games and I was playing on Steam) so I beat the story mode and then together (via chat) we started going through the game to unlock all the secret friends. The first secret friend the Twitch chat lead me to was Bandage Girl, also from Super Meat Boy. When I unlocked Super Meat Boy himself, I was tickled pink. It was an obviously frivolous addition to the game, but at the same time, it was the perfect level of non-committal to making the game different in anyway. And it wasn’t a super dose of nostalgia. If anything, I read the secret friends in the game as nods to great indie games of our generation. I got some others, including the female Spelunky character which made me smile wide, but I also kept thinking about the beginning of the game. The first time you hack down a wall a “Mysterious Wall Chicken” pops out, which when eaten grants back 80 health. The first time that happened I also laughed out loud because come on – Castlevania! Why the hell was cooked poultry popping out of the walls in that game? No one knows, and Dust made me laugh about it. Later in the night I got to a secret room and I couldn’t quit tell for the first few jumps what this room was hailing to until I realized that the music and particle effects were only moving when I moved. I was about to unlock Tim from Braid. Perfect. What a masterful game to quote in a game that might not be on par with Braid but one that perhaps acknowledges it and doesn’t feel bad for falling short. Later there was an area that populated isometric-view blocks as you ran forward. Bastion. And the final secret friend I unlocked was in a pixel area with three brain-busting puzzles to get through. Fez. The whole time my smile was growing as I was shaking my head. This is the way homage is intended to be. A slight tip of the hat, a comfortable acknowledgement of past greatness, and a shrug at the naysayers who don’t like what they’re playing as much as what they played before. This was perhaps the first game I had played that didn’t feel like it was pandering but was instead honoring. And that is 100% the nostalgia I can get behind. While the story had some facepalm moments and the voice acting was a bit try-hard at times, the gameplay, the art, the BluePrint system, and the music all made this some of the most enjoyable 14 hours I’ve dumped into an indie arcade in my life. If I play a game that has some Dust easter eggs in the future, I’ll tip my hat, smile, and remember fondly what came before. *I googled this to make sure I was saying the right thing because I don’t know my Marvel lore and don’t know anything about Howard the Duck, but lo and behold this was actually someone named Hyperduck? Which makes more sense when they both become Daft Punk. . . But anyway, I’m going to keep calling him Howard the Duck because I don’t know who Hyperduck is either. Sorry. Little bit of cross promotion here, but last week my co-hosts at Go For Rainbow interviewed Ian Snyder, creator of an indie game that’s quickly picking up press (and recently got put on Steam Greenlight) called The Floor Is Jelly. Unfortunately my schedule didn’t allow me to chat with Ian and the guys but I just finished listening to the episode and finally got a minute to sit down and play the game. I swiftly concluded I must write a blog post, because you all must play it (and vote for it on Steam Greenlight . . . just sayin’). The protagonist is a small two-legged creature attempting to traverse each level to make it to a window (and after a certain number of stages, an elevator to go to a new environment). The floor isn’t exactly jelly however – it’s a non-Newtonian fluid (or at least behaves like one). Any of us who spent extensive time on a trampoline as kids have a slight advantage, because it operates much the same way; propel yourself higher with the momentum of the rippling ground. The artwork is simple, warm, and beautiful. 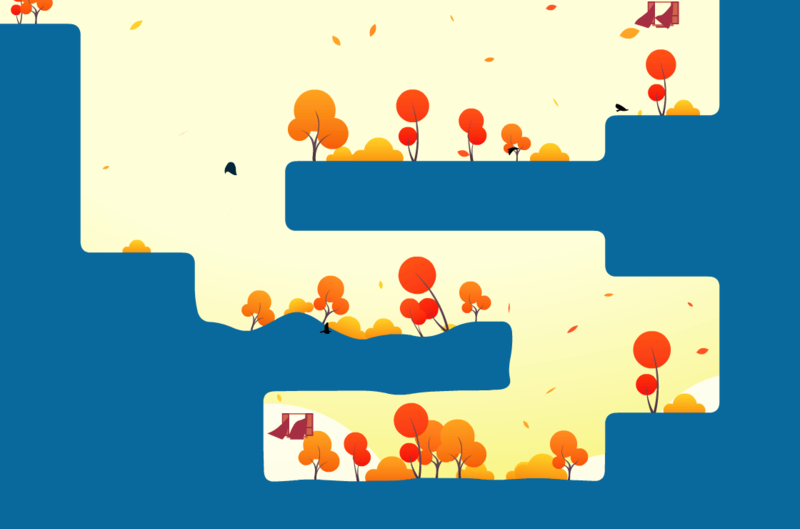 Rounded edges combined with a stellar soundtrack make the stress of continually dying in this challenging platformer seem to fly away on the digital wind blowing leaves across the background. The music is minimalist, but full-bodied – just my style. I haven’t gotten very far but each environment thus far in my quest has introduced a new gameplay mechanic (most recently, hitting a bullseye rotates the entire world to make what was previously a bouncy wall, turn to a bouncy floor). In short, it contains absolutely everything I love about the very best indie games have to offer. If I had a wishlist, I suppose I’d add some story to it but I bet players across the world are coming up with their own backstory just fine on their own. When you have a game this full of character, it would be hard not to. Right now you can pick up the game for $10 USD from thefloorisjelly.com, but you could wait and share the Steam Greenlight link if you’d prefer and pick it up in your Steam library because I’m sure in the very near future, this will be picked to make a Steam debut. I’ll tell you honestly – I forgot that I got a free copy of the game, went to the site after listening to the podcast and bought a copy, remembered I had a free copy already, played the free version (lamenting that I had just spent $10) but after playing three full stages (and itching to play more), am so pleased I supported Ian and his game, despite having a free copy. Pick up a copy, and leave a comment letting me know what you think of the game!